In ancient Egypt, it was believed that when a Pharaoh died, he would be born again and become an immortal being. This is the reason why Egyptians buried their Pharaohs’ possessions and treasures along with them, within pyramid tombs. It is also the reason why explorers throughout the centuries have attempted to plunder the tombs of these ancient kings. 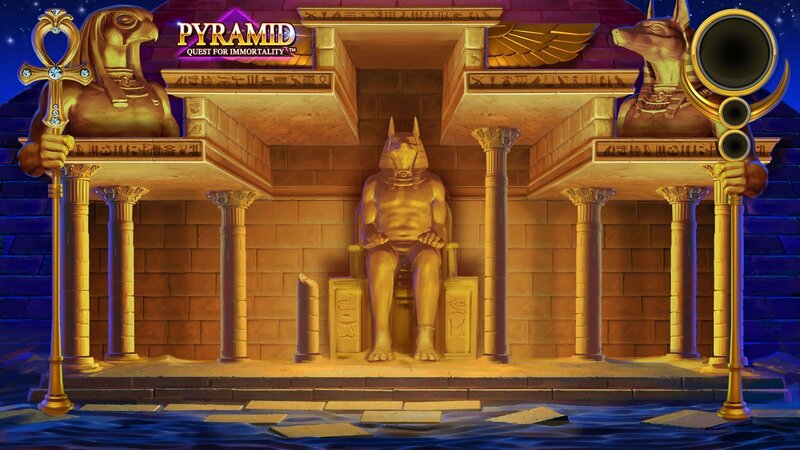 Now, Pyramid: Quest for Immortality, an entertaining and high-paying slot from NetEnt, gives you the chance to search for some of this priceless treasure. 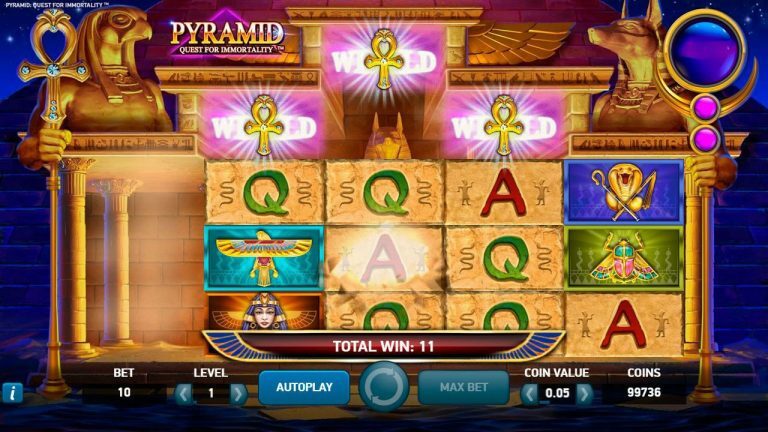 Pyramid: Quest for Immortality is a 5-reel video slot developed by Net Entertainment and draws its inspiration from life in ancient Egypt. This high-quality slot game has been designed with an unusual reel layout that is sure to give you a thrilling playing experience. Instead of the traditional spinning reels, this game features an avalanche mechanic. As a result, each time you score a winning combination, that combination’s symbols disappear and are replaced by a new set that falls into place from above. To add to the thrill of the avalanches, is the avalanche multiplier which increases by 1 with every 3 successive avalanches, up to a maximum of a 10X multiplier. Another special feature worth noting is the Wild generation feature. When a symbol appears at the top of reels 2,3 or 4 and is part of a winning combination, it turns into a Wild for the next Avalanche. The game also generates wilds each time a symbol, which forms part of a winning combination, lands at the top of reels 2,3 or 4. When it occurs, the symbol is turned into a wild symbol that you can use to win within the following avalanche. However, before you embark on your journey of adventure into ancient Egypt, you will need to set up your stake. The game’s coin denominations start at 0.01 and go up to a maximum of 2. These values are set by pressing the + and – buttons within the section labeled “Coin Value.” You could also click on the “Max Bet” button to set the value at the maximum available bet. There is the spin button represented by two swirling arrows, and pressing it sets the reels in motion. The game also features an auto play option that automatically spins the reels up to 500 times. The basic symbols that you are presented with when you take Pyramid: Quest for Immortality for a spin include a Pharaoh, an eagle, a cobra, a scarab and Cleopatra. Additionally, there are playing card symbols valued 10 to Ace. These are located on a background of stone covered in hieroglyphics. There is a golden Egyptian cross that is set on a purple background known as an Ankh which is the Wild. Pyramid: Quest for Immortality does not have any scatter symbols. Pyramid: Quest for Immortality unfortunately doesn’t boast a dedicated bonus round, like picking treasure chests. It would have been great to have some kind of dedicated bonus mini-game included. There does not seem to be a free spins feature, but there are many other interesting features. Every win on Pyramid: Quest for Immortality will unlock the Avalanche, which removes treasures from the pyramid, letting more treasures take their place. However, with every three winning avalanches, you get an increase in the prize multiplier up to 10x. Pyramid: Quest for Immortality does not have a dedicated jackpot, nor is it linked to any kind of progressive jackpot. However, to make up for this, the Avalanche multiplier mentioned earlier does provide the potential to win up to a mind-blowing 3,600,000 coins. This game gives you an astonishing 720 ways to win, instead of the standard slot paylines. Pyramid: Quest for Immortality has a very respectable RTP of 96.48%. Pyramid: Quest for Immortality is a highly volatile game, which means that there may be times you will need to be patient to score big wins but when you do, it will be worth the wait. The Egyptian theme is one that many developers seem to continuously return to. Either players love it, or the developers are fresh out of ideas. Pyramid: Quest for Immortality from Net Entertainment is well made, and the gameplay is entertaining. This slot probably could have done with a few more features, but overall, it’s a good game and it is easy to play. With an opportunity to bag up to 3.6 million coins, you have a good reason to take Pyramid: Quest for Immortality for a spin.